Our bath fizzies (or bath bombs) are made by hand using all natural ingredients. Our entire line of bath products are free of parabens, surfactants, mineral oils, detergents and chemicals so you can feel good about what you are putting on your skin. Do you love to soak in the tub? You are not alone, baths have been soothing since, well forever! Ancient Greeks established public baths for relaxation as well as personal hygiene. In our modern era with the popularity of jetted tubs, Japanese soaking tubs and #bathroomgoals it’s clear that baths stand the test of time. Whether for relaxation or personal hygiene, we love nothing more a nice long soak. It’s an instant stress reliever to start the water in the tub, gather a book and a cup of warm tea or a glass of wine. You brain has received the signal : it’s wind down time. A bath with a bath fizzie (or bath bomb) is a great way to offer yourself a little pampering and care. When you step in the tub, you want to be sure to have one of our Bath Fizzies to gently release into the water and watch fizz. As the bath bomb releases its tiny effervescent bubbles, the scent will slowly waft towards your nose. You may also notice the water starting to feel softer. Our bath fizzies are loaded with shea butter. The shea butter from the fizzie melts into the water and creates a soothing lotion for your skin. Have sore muscles? 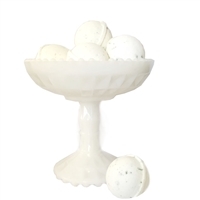 Try our bath fizzies (bombs) with mint : eucalyptus mint, mint julep or rosemary mint. Taking a bath before bed and want to get a great night’s sleep? Try our lavender bath fizzie. Love to smell like a flower? Give our hibiscus, red clover tea, or white tea ginger fizzie a shot. Looking to be whisked away to a tropical paradise, sipping a pina colada? Then our coconut lime fizzie is the perfect bath bomb for you. If you aren’t the kind of person that jumps at the chance to take a bath, you can always set up a foot bath at the end of a long day while you are watching your favorite show. As always all Nourish products are made by hand, in small batches, using only the finest all natural ingredients. Our entire line of bath products are free of parabens, surfactants, mineral oils, detergents and chemicals so you can feel good about what you are putting on your skin.